It might seem a bit odd, but it was current MSNBC political goddess and past Air America star Rachel Maddow whose radio “cocktail moments” largely propelled your loyal scribe’s fledgling interest in classic cocktails during the Bush II administration. Moreover, with an epic brohaha in Washington going on at the moment over the debt ceiling, it seems as good a time as any to pay tribute to her with this personal favorite. The sazerac is the official drink of New Orleans — though we didn’t hear of it on three trips to that wondrous city. That’s likely because, though beloved by serious cocktail buffs, the great drink’s pop cultural fame is next to nil, though we understand a sazerac was recently thrown in the face of food critic Alan Richmond on an episode of “Treme.” We are therefore happy to try and correct this great drink’s relative obscurity; properly prepared it’s an ice cold sipping beverage that’s tasty as anything else produced in the great city of New Orleans. It’s preparation is a little complicated to explain but, trust us, it’s not hard once you get the steps straight in your head. It’s really just a slightly more elaborate variation on the old fashioned. Start by chilling an old fashioned, aka a “rocks” glass, either by filling it with ice or leaving in the freezer or, ideally, both. Meanwhile, purists insist on muddling a sugar cube, but it’s much more efficient to simply dissolve the superfine sugar by stirring it in a cocktail shaker or room temperature rocks glass with unchilled water, whiskey, and bitters. Once the sugar is dissolved, add plentiful ice. Then, take the pre-chilled glass — if you’ve got ice in it and want to conserve precious water, consider adding it to the cocktail shaker/rocks glass with all the other ingredients — and add a teaspoonful of now legal but expensive absinthe or much cheaper Herbsaint (a very sweet but strongly anise flavored liqueur). Swirl the entire glass, coating it with the absinthe or Herbsaint. Then, turn the glass upside down over a sink, dumping out any remaining liquid. Now, return to the shaker or rocks glass. If you’re an absolute purist who fetishizes clear beverages, simply stir and strain it into the chilled and coated rocks glass. If you’re a borderline barbarian like us, you may shake like crazy and then add it to the glass which will be a lovely, frothy shade of pinkish orange or orangish pink. Then, take your lemon twist and coat the edge of the glass and twist the lemon peel over the beverage to magically deliver lemon oil to the drink. Some insist you must discard it without actually placing it in the drink. We and most others, however, drop it in. Sip immediately and toast the brave people of New Orleans, the great American city that just might have invented the cocktail. A couple of words about ingredients. 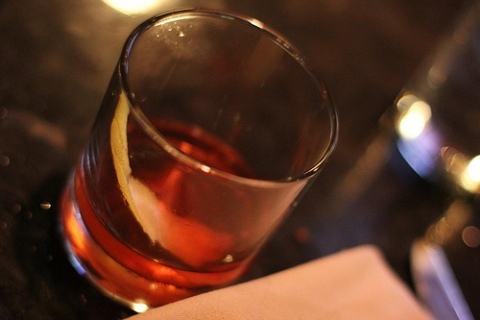 First of all, note that the sazerac — named for the brand of cognac it was originally made from — primarily uses Peychaud’s bitters. This brand may be the oldest type of bitters still on the market and it has a much lighter different flavor than the bitters you may know. Many sazerac makers, Rachel Maddow included, like to throw in a single dash of the better known and stronger tasting Angostura bitters to “open up” the flavor of the drink. On the other hand, especially if you’re making this with one of the stronger types of rye whisky — particularly a 100 proof brand like Rittenhouse Rye — it’s already one potent little beverage. It is, nevertheless, considered mandatory to use rye specifically if you’re making the whiskey version of the sazerac. You could make it with bourbon, we suppose, but it’s generally not done, possibly for a reason. While rye whiskey remains by far the most popular main ingredient, we have to say a good word for going super-old school and using cognac or even an inexpensive brandy; we’ve had great luck with an very inexpensive brand called Raynal, technically not cognac but entirely sufficient — which is carried by Bev-Mo and Trader Joe’s in California and perhaps elsewhere. It’s a more accessible version of the drink that goes down surprisingly well with cocktail newbies while being more than complicated enough for more experienced drinkers.